Impressive wild Bull in silver. This bull looks like in movement, walking around the pasture. This is an exclusive design of Barcino. 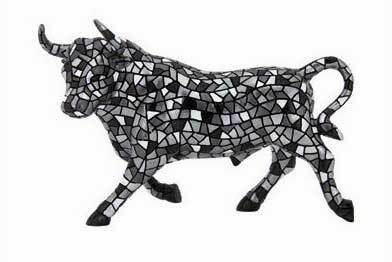 It is a resin figure with a innovative design inspired by the Modernist Mosaic Trencadís technique. It has more of ten colours and it is hand painted. This bull is pure Spanish craftsmanship; the bull is made by artisans who use Gaudi’s technique.